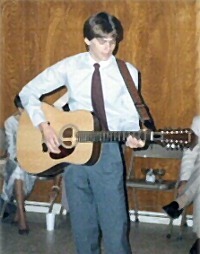 connection to acoustic music when he was just four years old. guitar training from David Gladkowski. 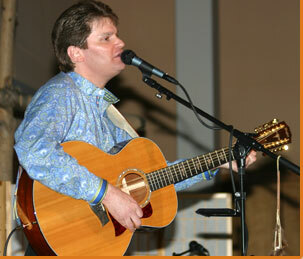 In concert, Chris' style finds a balance of 'acoustic folk'. 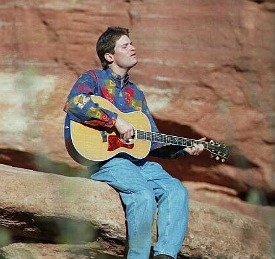 The clear tenor voice moves gently from familiar folk tunes to original interpretations of artists such as James Taylor and John Denver, and then to his own heartfelt compositions. What a wonderful message he shares with us in his introspective "I'm Coming Home" and his lyrical celebration of the holiday season with "Know It's Christmas". Hearing Chris in a live performance for the first time, people find themselves touched by his compassion. He encourages the audience to sing along…and by doing so, strangers become friends, brought together by the spirit of the music. With every song, Chris possesses the magical ability to hold the audience in his gentle grasp…making each listener feel he sings only for them, which, in truth, he does. receive the strongest reception during Chris' concerts. desire…I'm here to help and heal and learn." Every once in a great while, an artist crafts a moment that will not fade away but resonates year after year, song after song…striking a chord deep within. Christopher Westfall is a minstrel for our time. With a voice of energy and conviction, he brings us on a journey…like the soaring eagle's flight, full of spirit and emotion…and we are forever changed. "I wish it would last forever, but as long as I am able to sit with a guitar on my lap, not even to sing to people, but just to sing to myself, then I'll be alright."